their emotions, they actually talk to each other." "Its principal 'star' in Hollywood element terms is Joss Whedon, geek god, Buffy and Firefly creator and all round humanist, feminist and sometime writer/director (he's made some other movie called Scavengers or something, coming out this month too)." I wrote that with the almost certain knowledge that Whedon had been asked (and subsequently constrained) to make a blockbuster heavily reliant on CG effects and in pleasing his corporate masters (and boring me rigid), he'd have to reign in his character skills and toe a party line. Well, I was right (in a small and pathetic way) and, in some key areas, gloriously wrong. Whedon, fully observant of the needs of the studio, satisfies on big action (in the last twenty minutes, overly so just a tad – there's one too many of the giant, mechanised alien tadpoles and you don't get to write sentences like that every day) but he also plants characters in harm's way, real people despite their costumes and superhuman abilities. It's true that MAA – not the best acronym in our culture, one that has come to define 'so-so' and disinterest as 'Meh' – fulfils almost every blockbuster requirement but it does something else too. It makes you care. Despite the heroics on offer and the very solid, ubiquitous but almost overwhelming effects work, the humanity is still not only intact but vitally embedded, nestled at the beating heart of this enormous venture. This is a movie with extraordinary scope (visually and narratively) but it's also a film with real feeling and humour that (miracle upon miracle) does not undercut the absurdly fragile reality of the premise. You see, Whedon knows what we know – that Captain America's suit is hokey, that Thor and step-brother Loki are akin to gods, that the alien invasion schtick is terribly old hat now and that somehow a man in a metal suit won't turn to organic pate if he hits the ground hard enough but that's Whedon's strength; he knows the concept's inherent weaknesses because he's one of us (with a cooler address book content). He can play off these patently silly ideas buried in the concept's fantasy DNA and cast a fresh spell around them (and in the hokey uniform's case, make us care that it's hokey). Trust me, it's still the weakest costume, design wise but you understand why the Captain wears it. The idea of there being 'aliens' in Iron Man's universe is frankly risible but Downey Jnr. covers it with a simple throwaway line "I see it, still trouble believing it..." or something very similar (my memory's not fly paper even when they are Whedon's words). There is no way any sentient human being can take the story seriously. An alien/god uses the power of a large blue swirly box to open a portal for other aliens to... You know what? I don't give a toss about the story in the A to B sense. This is the first blockbusting, CG engorged, tent-pole action pic that satisfies the following criteria; if we really have to have enormous, ridiculous, Hollywood, bloated fare then let's please have Joss Whedon's enormous, ridiculous, Hollywood bloated fare. It's like he's the skip of sugar that helps the medicine ballistics go down. He's smart enough to deliver what's required and brilliant enough to invest what's required with character, humour and intelligence. Despite what the marketing would have you believe, this movie is about people and their woes, sacrifice, honour and above all, humour in the face of an adversary (or thousands of the alien lizard infantry). Whedon does something that seemed at the outset to be nigh on impossible. He allows and infers upon the comic book characters some dignity and realism while undercutting them at every turn via some of the best comic banter I've heard all year. There are edits in this movie that reveal a talent for comedy timing that Python would respect. I'll keep this review spoiler free but when the villain Loki faces off with Mark Ruffalo's alter ego, there is an edit at which it's impossible not to be shocked into wide eyed surprise which gives way very quickly to a great wave of hysterics. And there's nothing quite like the shared experience of an audience all exploding into laughter in a cinema. In fact, it's even better the second time around (I'm not a glutton, just a supportive father who could not rob his 15 year old of seeing this movie before releasing him to the terrible drudgeries that are revision and exams). In fact the audience at the second viewing actually clapped at this scene. "Puny god," indeed. When was the last time anyone clapped at a Hollywood mega-movie? There was even a smattering of palm to palm at the end. People, it seems, are having fun and it's making serious money (and still three days away from opening Stateside. The one area Whedon has not poured considerable effort into is in the threat department. I suspect his hands were tied by Marvel's needs. We never get a clear idea of precisely why the bad guys want to do what they do or what the main bad guy will get out of engineering the mayhem (taking over the world seems so quaint these days). I'm not saying the film falls on the believability of the MacGuffin but to assemble (Ikea, therefore I assemble) such a team and have their enemies without a clear agenda is throwing the movie off course but it's not that anyone cares too much (there's that word again) as long as the thrills and the laughs are in place. 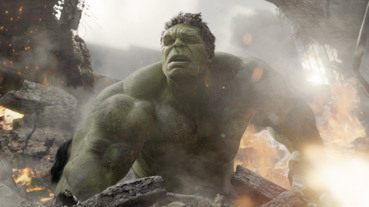 Stealing the acting honours is Mark Ruffalo whose weary Bruce Banner struggles daily to keep the 'other guy' under wraps. It's such a casual turn reminding me that really good actors make it appear like they are doing nothing. The subtlety of his civvies costume design is very pleasing. He wears the clothes of a slightly bigger man and looks swallowed up by them. I imagine this is to allow his alter-ego some dignity. It's not easy being green. If there was going to be one character and actor who'd command centre stage, no prizes for guessing who that would be. More than any other character, Robert Downey Jnr's Iron Man (aka Tony Stark) has more Whedon DNA than any of the others. Behind the scenes, Downey Jnr. was always the star of the piece and Whedon has to sensitively acknowledge this and ended up enjoying a very satisfying relationship with the actor. Either that or he's a great liar and R.D. Jnr. is a megalomaniacal control freak. A guy with that much screen charisma has to be a blast to work with, no? When their work is this polished and entertaining, I don't care if Joss is Robert's new best friend or his mortal enemy. Just as Hoban 'Wash' Washburne spoke for Whedon in Firefly, so Stark fulfils the same role in the Avengers. Downey Jnr. may get all the juicy put downs but it's the least likely comedian of the bunch who gets the most and best laughs. He's green, by the way. 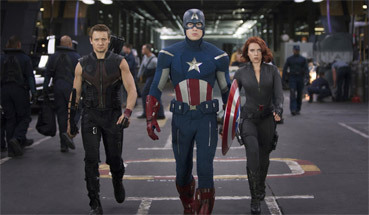 It's another small miracle that all the other Avengers (including the turned-to-evil Hawkeye – Jeremy Renner – and the attractive and über-violent Black Widow – Scarlett Johansson) get their moments in the sun. Balance was always going to be this movie's greatest hurdle and Whedon has cleared that bar with metres to spare. There are some who suggested that within Marvel's own corporate constraints, Whedon has put on screen what every fan-boy/girl wants to see made real by photorealistic CG. While this may be the case (there are many fan-pleasing moments, some even relevant to the plot) it's still not enough to hang an enormous movie on. A movie has to have heart. Well, given what this movie is and always had to be (big, expensive, CG saturated and action galore) it's a small wonder – but a very much appreciated wonder – that Whedon has managed to score so well on the 'heart' appreciation index. Marvel Avengers Assemble is not Bergman, Welles or Kubrick. But for what it needed to be, it's extraordinary that it's this much fun.